Take my money already! The mothership hasn’t explicitly said the San Francisco event will be used to introduce their sixth generation smartphone. Nevertheless, after months of wanton speculation, Apple is finally ready to get real — the official iPhone 5 release date is September 12 and anything else that arrives on or after that date will be gravy, just gravy. Moments ago, the company broadcast invitations to a special event at San Francisco’s Yerba Buena Center for the Arts Theater on Sept. 12, a date reported earlier… The text of the invition is simple, reading “It’s almost here.” And it offers no details beyond that. 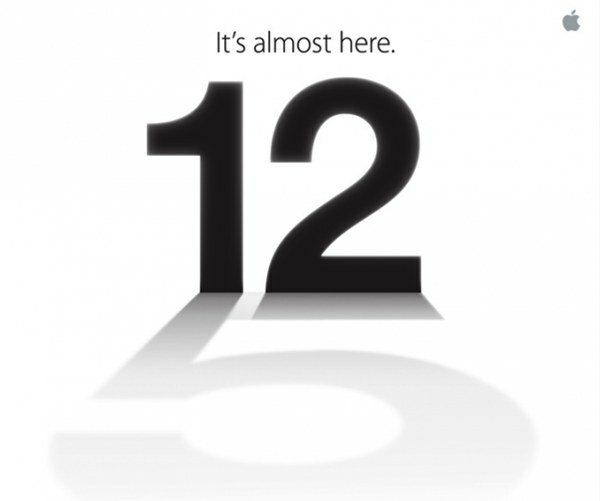 But the large “5” that appears in shadow beneath the number 12 blazoned across the invitation strongly suggests that the focus of the event will indeed be the forthcoming iPhone 5, or whatever Apple chooses to call it. With the official iPhone 5 release date nailed down, the world can now relax. Perhaps not as the iPad mini, 2012 iMac, 13-inch Retina MacBook Pro, various iPods and, not to be forgotten, Mac mini are all expected sometime before the end of October, as well.